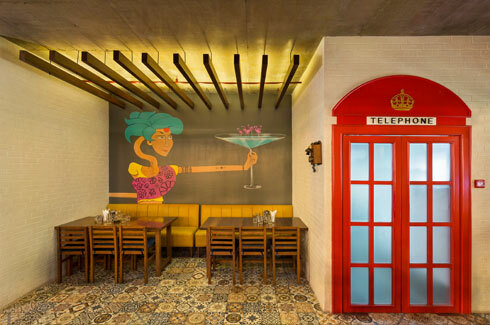 SAGA Designs’ twin restaurants – ‘The Captain’s Table’ and ‘Me So Happi’ – are an unorthodox juxtaposition of innate sophistication and frivolity. Restaurants today have gone beyond just providing a run-of-the-mill dining experience. Patrons and restaurant-goers look for more than just food when they choose a restaurant. 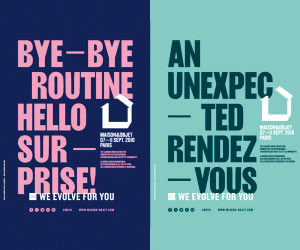 Apart from proximity, they consider ambience, setting, vibes, and novelty when it comes to answering the age-old question – where should we eat tonight? 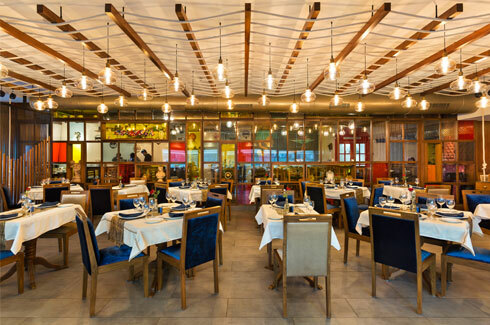 Mumbai-based design firm SAGA Designs, headed by Mayur Gujare and Deval Shah has created what can only be described as an inimitable dining experience. ‘A blend of casual and fine dining spaces’, Me So Happi and The Captain’s Table will indulge the child as well as the suave diner in you. Lighting plays a significant role here. That with the view of the sea through the glass windows makes for a wonderful setting. Having worked with renowned architects like Christopher Charles Benninger (CCBA Designs, Pune), Mayur had a very determined and meticulous approach when he began working on this project. 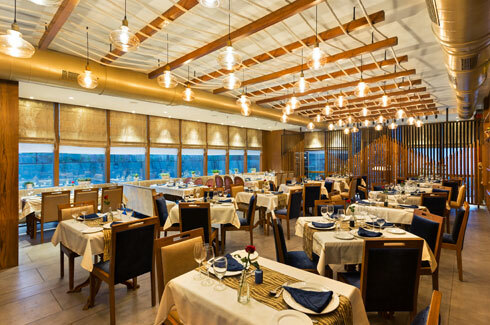 The brief was simple: global seafood cuisine with an air of sophistication and class, and dining at the restaurant should be equivalent to dining in the cabin of a ship’s captain! The hostess’ table is supported by an actual anchor from a fisherman’s boat. ‘Figure-Eight-Knot’ ropes which are elemental in sailing, can be seen at the entryway and have also been used to separate the dining space from hostess’ table. This separation gives the dining area an immediate distinction from the other areas of the restaurant. The hostess’ table is anchored by an actual fisherman’s anchor and the top is made out of wood procured from a ship’s deck. 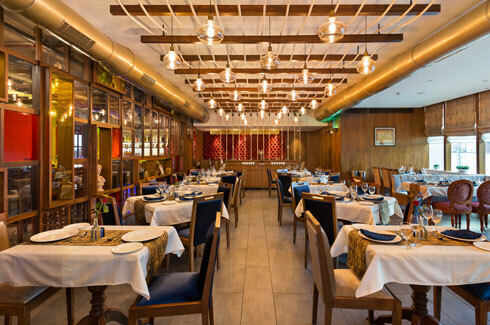 The tables and chairs in the seating area reflect the eclectic personality of the restaurant, with carved legged tables, blue and beige upholstery and maritime knick knacks adding to the overall allure of the space. Perhaps the most interesting feature of The Captain’s Table is its ceiling that in turn helps in establishing immediate hierarchy of space. 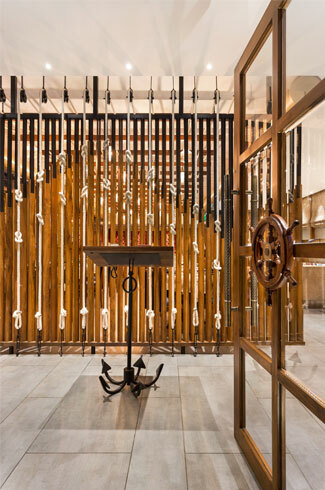 Ropes draped to look like waves and supported by rafters lend a typical ship-like ambience to the dining area. Elegant, yet simple light fixtures drop down from the ceiling like chandeliers, minus the ostentation. Tall and clear windows cover two sides of the restaurant. With bright sunlight pouring in through them, and the vast blueness of the sea making for a spectacular view, diners can as good as indulge in a meal on-board. Now, while The Captain’s Table is an exemplary display of class and grandeur, Me So Happi is an ‘elaborate nostalgic trip to childhood days’. With the entrance to both restaurants being the same (before they branch out in different directions), “What was important for us was the screen between the two spaces,”says Deval, who feels that “combining two extreme functions in a single space” was a bit of a challenge. Coloured glass partitions (like screens) that serve a two-fold purpose separate the dining spaces – “letting one peek into his playful mood while dining on the sophisticated side and look onto the other while still being at play,” says Deval. Me So Happi also gets most of its woodwork from ‘shipwrecks’. High tables and chairs have been strategically designed and placed in order to maintain the openness of the restaurant space. 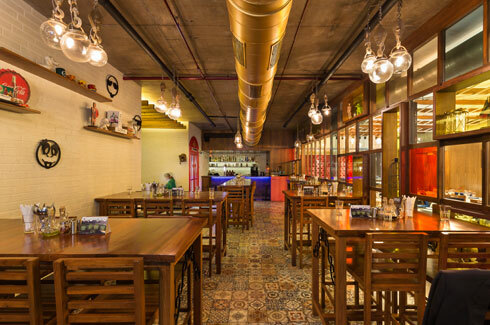 Spanish patterned tiles having intricate designs in lively colours have been used for flooring, thereby not allowing the rugged furniture to overwhelm the design scheme. A semi-private seating, perfectly capturing the mood of the restaurant. Light fixtures, representative of nautical elements, drop down from the untouched concrete ceiling, and brick walls, though painted in a soft earthy tone, further enhance the ruggedness of the space. Wooden ledges placed on the brick walls house artefacts, each one a symbol of childhood and years gone by. With the pipe-work openly visible there is a steam-punk like vibe that lingers. A bright yellow couch adds a dash of colour in a smaller section of the seating area. On the wall rests a painting of a saree-clad woman, cocktail in hand. In a way, this painting summarises the philosophy of both the restaurants – rooted, yet fanciful. Greatly inspired by the works of Le Corbusier and Frank Lloyd Wright, SAGA Designs has created a stylised cornucopia of textures, lights, moods, and materials. All aboard, folks!